Finding an ink stain on your leather furniture is disheartening. Leather is a durable material, but it is not resistant to ink stains. Whether print from a magazine or newspaper transferred onto your leather sofa or an ink pen exploded on your leather chair, it is important to remove ink stains at first sight so the leather does not become damaged or discolored. 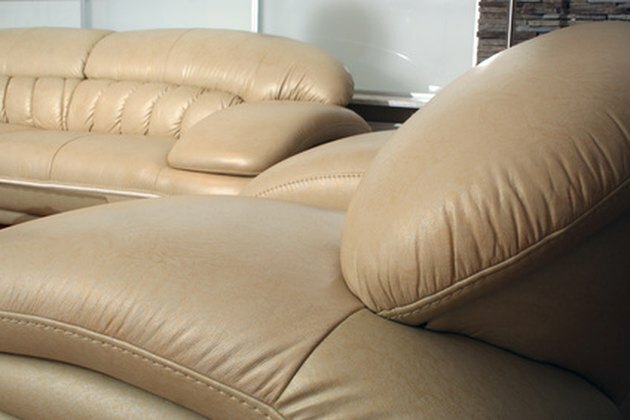 Preserve the beauty of your leather couch by removing ink stains promptly. Remove as much ink from the leather furniture as possible by blotting with a soft rag. Blot until no more ink transfers from the leather to the rag. Avoid rubbing or you risk spreading the ink further. Apply a pea-sized drop of bleach-free liquid dish soap onto a soft toothbrush. Rub the toothbrush gently in a circular motion over the ink stain until it has lifted completely or at least lightened. Wipe the leather clean with a damp rag. Moisten a cotton swab with rubbing alcohol. Wipe the alcohol-soaked cotton swab over the ink stain until it disappears. Switch to a clean cotton swab and apply more alcohol as the cotton swab becomes filled with ink. If the alcohol does not remove the ink stain completely, use non-acetone nail polish remover in the same fashion. Wipe the leather with a damp rag to remove any traces of the alcohol or nail polish remover. Clean the leather with a leather cleaner and then apply a leather conditioner to restore moisture. Follow the manufacturer's instructions for using the leather cleaner and conditioner, as this will vary among products.